Looking for Arvixe promo codes and coupons? #MasterTheWeb and save money today with our exclusive The Webmaster offers. With this coupon you get 30% off Hosting, which is better than anything else you will find. If you are wanting a pretty hefty discount code for Arvixe, this is the one for you. You get 20% off any Arvixe PersonalClass, Windows or Linux plan. This can only be used for new customers, though. This is a great coupon, especially those with a long term view or perhaps for those who wish to pay for a shorter period up front. With this coupon, you get 10% off Shared Hosting or VPS Plans for life. To use your chosen Arvixe Coupon you simply need to click the “Buy Hosting” button, or “Reveal Coupon.” We suggest the latter as you may need the revealed code. By doing this, a new window will open to their website, and the code will be copied to your clipboard. During the order process (see below), you will then be able to insert it in the appropriate box. 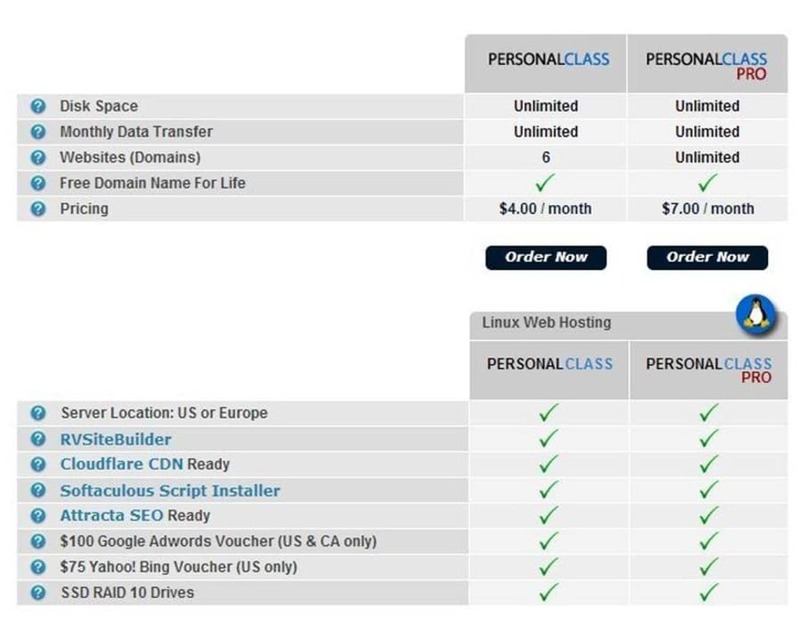 To host just one or two websites, I recommend the Personal Class plan. If you need to host multiple websites on the account, then I would recommend the Personal Class Pro Plan as it comes with more resources. For high traffic or complex websites then you might want to consider their Business or VPS plan. Choose your hosting plan. © The Webmaster. Choose Product and enter Arvixe Coupon. The first stage is to confirm your product selection by selecting the required product as well as the term you wish to pay for. You will see that you receive a considerable discount for paying two years in advance, so this is what we would recommend. You will see on the top right of the page a place to enter your discount coupon. If you clicked one of our hosting coupons (and clicked the copy to clipboard button), you should be able to right click and paste the coupon code into the box. Otherwise, feel free just to type it in. Choose Product and enter Arvixe Coupon. © The Webmaster. In this step, you either need to log in if you are an existing client or enter your billing contact information along with a Username and Password you wish to use for the account. Remember to click your agreement to the Acceptable Use Policy and Terms of Service. We highly recommend you read these as there are always restrictions you should be aware of, especially on an unlimited hosting plan such as this. Configure product and continue to Checkout. Here you can enter your free domain (free for the lifetime of your account), transfer your domain, or neither (you can point your existing domain at the server). You have another Username & Password to enter for your hosting login. 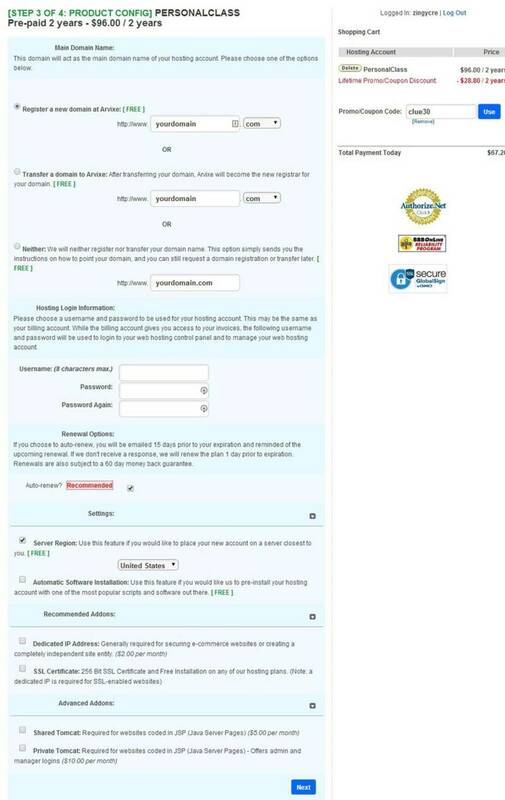 You can choose whether to auto-renew, which region you wish to host your website in (EU, US or Hong Kong), and whether you want any software, such as WordPress, to be preinstalled (you can always use the one-click Softaculous installer later). You will see details of the Arvixe Coupon that you previously entered to the right of the screen. Configure product and continue to Checkout. © The Webmaster. You will go to a small intermediate page requesting final confirmation of the order. Place Order © The Webmaster. Without knowing your website, and how many visitors, it gets this is difficult to advise on this. Arvixe has a variety of plans available, including shared hosting, VPS hosting, business hosting and dedicated server hosting. If you’re starting a small, personal website that probably won’t get much traffic in the beginning, then you may wish to consider their basic shared hosting plan. You can later upgrade this to something more advanced when your website grows. Yes, you can pay monthly: just pay for one month of hosting with your initial sign-up. However, it’s worth considering that your coupon code will only apply to your first invoice period, so after that, your service will renew at the regular rate. This means that you will get a bigger discount by paying for a longer time in your first payment. What other billing cycles does Arvixe offer? You can choose from monthly, six-monthly, yearly, or two-yearly payment plans. These payment plans are available on all of the hosting types, including shared hosting, dedicated and VPS plans. Does Arvixe offer a free domain? Yes, all of Arvixe’s hosting plans include a free domain name registration; this applies to the domains .com, .net, .org, .us, .info and .biz. The domain will always be free for as long as you continue to renew your hosting with Arvixe, and the offer also applies to domain name transfers. Arvixe accepts Visa, American Express, Discover, and MasterCard. They also accept PayPal, Skrill, Bitcoin, Amazon Payments and Alipay. Yes, Arvixe does accept payment via PayPal. Arvixe does accept payment via Bitcoin. Yes, Arvixe offers a 60-day money-back guarantee for new shared hosting accounts. Refunds are available for hosting costs only, with add-ons such as domain registrations or SSL certificates specifically excluded. Any claim must be made within 60 days of opening your hosting account with Arvixe. Yes, your price will go up if you have utilized our one-time discount, as it only applies to your first invoice. You make larger savings by signing up for a longer billing term. Does Arvixe offer domain privacy? Yes, even though it’s usual for hosting companies to charge an additional sum for domain privacy, Arvixe offers domain privacy for free. When you get a new account, just click the checkbox titled “Private Registration” when ordering. What is Arvixe’s “Automatic Software Installation”? This is an extra feature that is given to Arvixe customers free of charge when they get a new account. If you need a particular software installed on your hosting account, such as WordPress, Joomla or PrestaShop, then you can install it easily within minutes via their automated system.